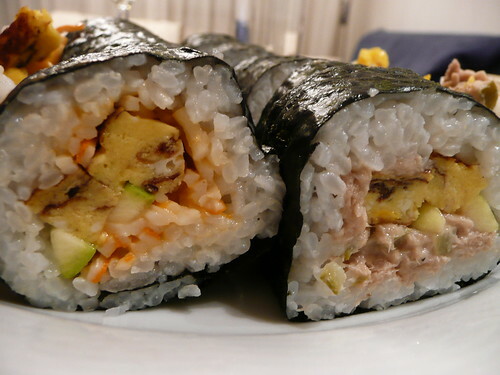 Been in the sushi mode lately and this time round, I decided to try my hands at making a new ingredient to fill the maki - the Japanese sweet omelet also known as Tamagoyaki. The ingredients for the Tamagoyaki are simple but the cooking process can be quite a challenge. Saw on NHK the other day that a cook assistant spent like a year just making Tamagoyaki for the restaurant before he finally 'graduated' to the sushi counter. (-) I do not have the squarish cooking pan so I used the usual round pan and naturally, the omelet did not turn out as nice. (=) Take note not to add too much oil while frying the egg. Hence, try to use a non-stick pan for this purpose.